The first thing you notice is the spacious interior, largest interior of any VW, 2 cubic feet larger than a 300SD Mercedes Wagon. Not like getting into a Jetta, more like getting into a Buick or a 500 series BMW or a large Audi because a B4V IS an Audi-bodied Passat, built by Audi in Germany. A 6'6" driver easily fits in the 8-way adjustable driver's seat. When that tall driver has the seat back an equally tall person can sit behind the driver and his knees will not touch the back of the driver's seat. Most Jetta rear seats are for kids. Large bodied adults easily fit in the rear of a B4-TDI and its got five 3-point seat belts. Low RPM engine torque and a high ratio 5th gear transmission are two of the main reasons for the incredible MPG of a B4V-TDI. and are sucking a LOT of gas at that RPM. The B4-TDI engine "Red lines" at 4800 RPM, so at 3500 RPM/100 MPH its still 1300 RPM south of its limit. This is why a B4-TDI speedometer goes to 140 MPH. These cars will go that fast, built for the left lane of the Autobahn. Very well built smooth driving high speed German car. just loafing along at 70 miles per hour. 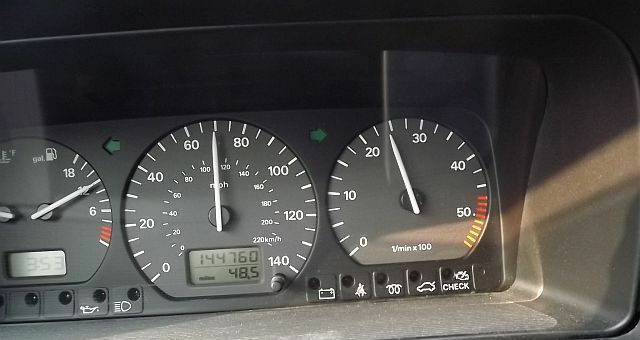 The engine running at low RPM gets great mileage! The 4th photo was taken at 3:53 at 70 Miles Per Hour, trip meter was 48.5, one minute and 1.1 miles further down the road. Interesting how much more distance can be covered in a minute between 70 MPH and 100 MPH. A B4-TDI is a high speed smooth driving road car that feels very comfortable at high speeds. At 100 Miles Per Hour the car is still 1300RPM under Red line. That’s why these cars have a speedometer that goes up to 140 MPH, because they will go that fast. All that performance with 90 HP engine! The balance between the HP, the Turbo and the transmission gearing is mechanical performance poetry! Anybody that drives one of these unique TDIs will want to own one. NICECARS has now upgraded and sold 265 of the B4V-TDIs, the Wagons and over 200 of the B4S-TDIs the Sedans. We've also converted 27 GLX Wagons to TDI. We specialize in B4s because they are the absolute best TDI's.